UK police released new sketches Monday of a man they are seeking in connection with the investigation into the disappearance of British girl Madeleine McCann. 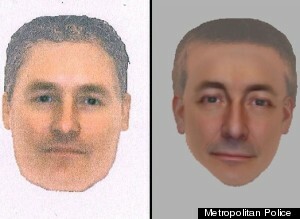 According to Metropolitan Police Inspector Andy Redwood, the two new images are of the same man. They were digitally constructed based on interviews with two independent witnesses, who reported seeing a suspicious-looking man in and around the Portuguese town of Praia da Luz on the night McCann disappeared. The images show the face of a white man, of medium build, with short brown hair. Authorities estimate he is 20 to 40 years old. "The timeline we have now established has given new significance to sightings and movements of people in and around Praia da Luz at the time of Madeleine's disappearance," Redwood said Monday. McCann, of Rothley, Leicestershire, was 3 years old in May 2007 when she went on a trip to Portugal with her parents, Kate and Gerry McCann. The couple was dining with friends at a nearby restaurant when the little girl vanished from their holiday apartment in Praia da Luz. There have been no solid leads in the case since that time. The newly released images are part of a new appeal authorities have launched in an attempt to garner leads in the search for Madeleine McCann. Investigators are asking the public to look carefully at the images and to contact them if they recognize the man, or if they were in Praia da Luz on or around May 3, 2007, and have "not yet spoken to the police." This latest appeal in the case comes one week after authorities announced they are examining cell phone records of every number that was used in the Praia da Luz area at the time of McCann's disappearance. The Metropolitan Police Service is offering a reward for information leading to the identification, arrest and prosecution of the person or persons responsible for the abduction of the girl. A photo of Madeleine McCann that was taken when she was 3 years old.